A thorough evaluation of the mouth, teeth, gums and other oral structures is the only way to properly assess and maintain oral health. Any attempt at evaluation, cleaning or treatment without the benefit of general anesthesia will fall short. 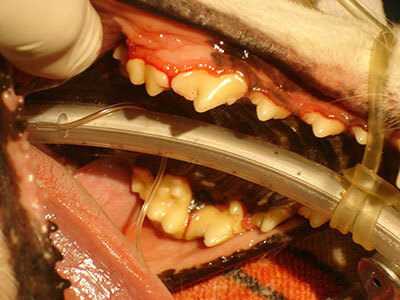 The vast majority of serious dental problems in dogs and cats occur below the gum-line. This is a sensitive area and even more so with any periodontal or other disease process. 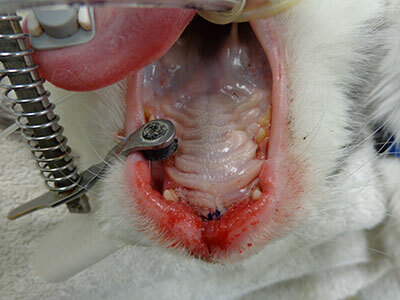 The photos below are examples of typical cases seen at our practice. 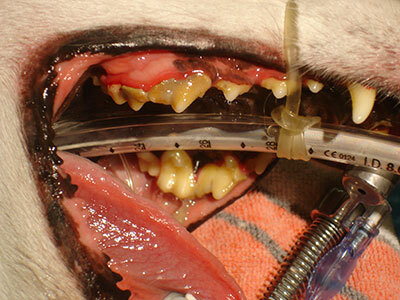 They illustrate the type of care needed to keep your pet's mouth, and overall system, healthy. The photo on the left shows a normal looking mouth in a middle aged dog. The instrument is a 12mm probe. The photo on the right shows the probe in a deep pocket behind the last premolar. There was no evidence of a problem except for mildly bad breath and reluctance to chew on that side of the mouth. There was an infected root on that tooth and the tooth was removed. 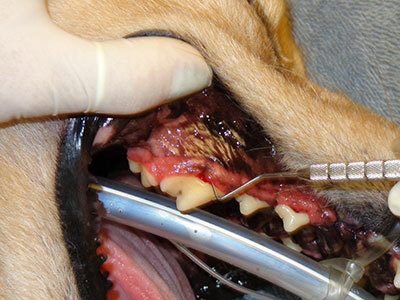 The issues noted by the dog's family resolved after the tooth was extracted. 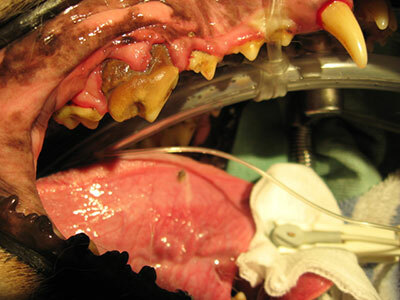 These photos demonstrate heavy tartar and calculus deposits on a dog's teeth before and after cleaning. Notice the inflamed gum tissue with deposits present on the teeth. Then the same teeth after cleaning. 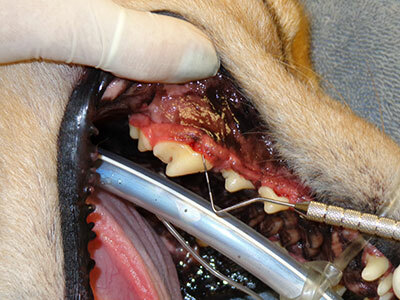 Dental cleaning will significantly reduce infection in this dog's mouth. 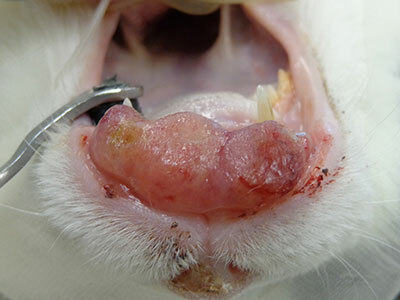 These photos show a large cancerous tumor in the mouth of a cat before and after surgical removal. Early identification and treatment of these tumors results in a much improved prognosis for long-term survival. Severe advanced periodontal disease that will likely result in multiple extractions to control oral infection.